Highways England is gearing up to promote motorcycle safety at one of the biggest events in the British motor-racing calendar. Tens of thousands of motorcyclists and motor-racing fans are expected to flock to the Northamptonshire racetrack over the weekend of 19 to 21 April. 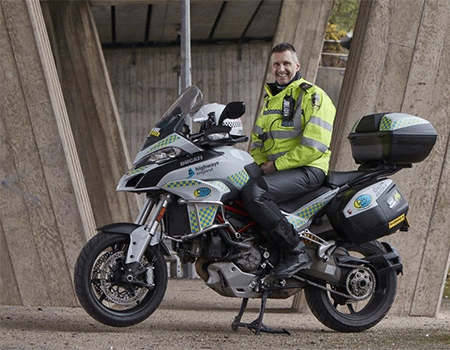 BikeSafe, the DocBike charity and Biker Down initiative, Highways England will also be there to advise visitors and enrol motorcyclists on potentially life-saving courses. “We are committed to improving safety on our roads and are conscious that motorcyclists are one of the most vulnerable groups of road users. BikeSafe aims to reduce the number of motorcyclists involved in accidents on the road by improving skills, knowledge and hazard awareness. The Ducatis are used to help deliver the BikeSafe workshops, feature at shows, events and bike meets. “Coming along to British Superbikes allows us to spend time with riders of fantastic machines and convince them of how much more enjoyment they could get from their bikes if their riding and attitude to safety had been taken to another level by doing a BikeSafe workshop and further training.